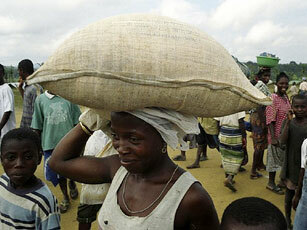 A woman carries food from an aid organization in Liberia. Though its civil war ended years ago, Liberia remains politically and economically unstable — and more may suffer as food and fuel prices rise around the world. Glenna Gordon is a freelance writer and photographer currently based in Monrovia, Liberia. She has reported from Uganda, Kenya, the Democratic Republic of Congo, Sudan and Rwanda and writes at the “Scarlett Lion” blog about encountering a trio of problems in Liberia: food, money and transportation. Before I came to Liberia, friends and colleagues warned me that it wouldn’t be easy. It isn’t. But in ways that are different than I expected. Thomas is a nice young man who comes to our house about once a week to wash clothes. On Tuesday, I asked him if he wouldn’t mind picking up a few things for us at the vegetable market. I don’t have time to go and haggle over the price of an avocado every week, and it’s a way for him to earn a little extra money. He brought three moldy heads of cabbage, tiny onions (not the shallot kind, the picked-before-they-were-fully-mature kind), mushy potatoes already gone bad, instead of a pound of fresh tomatoes about a dozen small jars of tomato paste, and four avocados that won’t be ripe for at least a few weeks. Fifteen dollars later, I plan to give all guests who visit my house over the next few weeks a small jar of tomato paste as a parting gift. There are no ATMs or banks linked to the international banking system in Liberia. That means no Visas, Master Card, Barclays, or any other bank card will get you cash if you stick the piece of plastic in a Liberian ATM. It’s all EcoBank, all the time. I’ve been trying to get my bank at home to wire money to my EcoBank account. This isn’t easy. I have to fax them a form. There aren’t a lot of working fax machines in Liberia. Since that technology is based on land lines (which there aren’t) and became vogue in a tech era of yore (when Liberia was at war), this is difficult. My boyfriend found one, and faxed the form. The bank won’t accept it because it was a scan, and not a fax. I’m not sure how that happened. Finally, through only slightly duplicitous means, we got money into our EcoBank account here. I went to the bank yesterday to withdraw. The bank’s computer system was down. There isn’t really public transportation in Liberia in any sort of organized way. You can flag down a yellow taxi (literally a falling apart four door small vehicle), squeeze in the back where four people always sit, or in the front, where two people sit next to the driver, and pay about 5 LD for a ride (that’s Liberian Dollars equivalent to about eight American pennies). But, there aren’t enough taxis in town and you might wait up to an hour to catch a ride which may or may not take you where you need to go, since there are also no set taxi routes. Photo courtesy of Flickr user Peter Casierunder a Creative Commons license. After Australia lost a tenth soldier in the war in Afghanistan, the second to be killed this week, Prime Minister Kevin Rudd told Brisbane Radio on Friday that “We think our current commitment’s about right” — despite a NATO request for more troops. There are currently about 1,000 Australian troops in Afghanistan. Raoul Heinrichs is a scholar at the Strategic and Defence Studies Centre and engages in a discussion on Australia’s role in the war with an anonymous Australian soldier below, courtesy of the “Interpreter” blog. 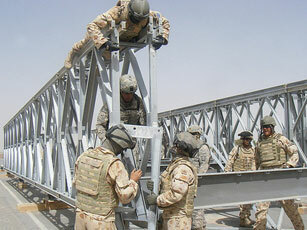 Australian and American soldiers in Afghanistan. As things go from bad to worse in Afghanistan, President Obama has begun the familiar process of managing expectations, conscious that the barriers to success, however modestly defined, remain virtually insurmountable. With his credibility at stake, however, Obama is gambling on more forces, a more realistic strategy, and the comforting thought that Afghanistan has finally been afforded its rightful prominence among competing strategic priorities. For its sins, the Rudd Government’s loud and frequent calls for a more coherent strategy have been answered. Canberra is under no illusions about American expectations, and is almost certain to enhance its commitment to the war. Against this backdrop, a number of Australia’s leading strategic thinkers have made the case for Australia to substantially upgrade its military presence, to double or triple its force levels, or take responsibility for Oruzgan province. These are, in my view, eminently misguided recommendations. In operation, they would be dangerous, costly, and out of touch with the scale of Australian interests in Afghanistan, as well as the strength of our alliance position. While the Government should seriously rethink its long-term commitment to the war, if it is determined to ‘stay the course’, here are some strategic considerations that ought to guide the size and composition of any additional contribution. 2. Australian involvement is, and always has been, an exercise in alliance management. […] Australians are naturally uncomfortable with the thought of fighting a war for the sole purpose of currying favour with an ally, despite a proud tradition of doing precisely that. The Government tends to emphasise other, more appreciable objectives. In reality, though, Australia has few, if any, direct interests in Afghanistan. Where it does have some peripheral interests, in Pakistan, it has no capacity to affect them at any credible level of cost or risk. Few people understood this better than John Howard, and it is to his model of alliance management to which Australia should now turn. This means being entirely symbolic with any additional contribution, supplementing it with regular and conspicuous expressions of diplomatic solidarity. Like Iraq, the key to effective symbolism in Afghanistan is to maximise Australia’s visibility, using the lowest acceptable number of personnel, subject to the lowest levels of risk. [W]hile I agree with some of Raoul’s ideas, perhaps the use of a different and more diplomatic title should be considered. Being a special-operations soldier who served in Afghanistan, I understand that our contribution may not turn the tide, but considering the cost of what we are doing (especially in light of the recent ninth casualty) perhaps rephrasing the title would be appropriate. While to some, Australia’s contribution may seem token, sometimes we need to be reminded that some of our guys are being killed. And it really doesn’t feel token when an RPG explodes in front of you. 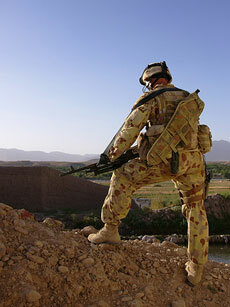 An Australian soldier on patrol in Tarin Kowt. Moreover, what is going on in Afghanistan is not a ‘war’ — it is a counter-insurgency occurring predominantly in the areas occupied by the Pashtun people (a notoriously proto-insurgent people and one of the largest ethnolinguist groups without sovereignty) who inhabit the arbitrary Afghanistan-Pakistan border region. The situation is dire, needs a significant change in perspective, and would most certainly take a long time to stabilize, but the assumption that the ‘war is already lost’ is premature. 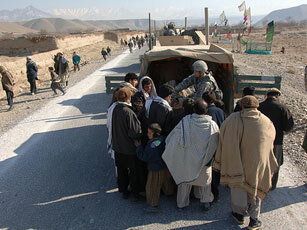 Counterinsurgencies live and die with the population. Until we have the support of the population and local ownership of the stabilization efforts we will not be able to defy history and avoid the fate the Soviets and British suffered. We need to alter our strategy from a military-led strategy, which is inherently inflexible, to a more nuanced approach which takes into account and respects the intrinsic complexity of a society with as much cultural solidarity as the Pashtun people — the classical ‘strong society, weak state’. Soldier X at once seems to accept Australia’s commitment as strategically tokenistic, and at the same time recoils from the thought of it being described in such a way. It’s a telling position, not dissimilar to the view held by our own Government. Above all, it reflects the strange disjuncture that has grown between Australia’s operational and strategic realities in Afghanistan — between the extraordinary exertions of our servicemen on the one hand and the symbolic political purpose to which their overall effort is being directed on the other. As I suggested, Australians are naturally averse to the idea of fighting wars for tokenistic purposes, simply to consolidate Canberra’s credentials as a reliable US ally. To civilians in Australia, the acknowledgement of this as our fundamental purpose in Afghanistan would be unpalatable and, frankly, a little disempowering. I can only imagine how disconcerting the same thought must be to our soldiers on the front line, exposed to the horrors of war and whose lives, as we were tragically reminded this week, are very much at at stake. I think we do ourselves no favours by mincing words. That the war has begun to exact a greater human cost only reinforces the need to think and speak as clearly as possible about what we’re doing in Afghanistan, why we’re there, and whether – under conditions in which none of our vital national interests are stake — we should be prepared to expend the lives of our soldiers. For more on U.S. allies in the war in Afghanistan, listen to our Online radio show on Canada’s role in Afghanistan. Photos courtesy of Flickr users david_axe and Army.mil under a Creative Commons license. Several years ago, Rudolph Giuliani — the former mayor of New York and 2008 presidential candidate — headed to Mexico with his consultancy company, hired to help the country curb crime with a “zero tolerance” policy that had been credited with reducing crime in New York. Richard Grabman is an American author living in Mexico. He writes at “The Mex Files” blog that harsher laws against vagrancy have thrust some homeless street children into even darker situations. “Social cleansing” — limpieza social – is what El Universal recently called the “zero tolerance” policy (pushed by Rudolf Guiliani, who was hired to make recommendations to Mexico City’s police) that is forcing street children into prostitution. I don’t want to romanticize the plight of the “children of the streets”, but I think they may have been better off living in the parks. It seemed, based on nothing but casual observation, that there was usually a food brigade, a laundry brigade and a “hanging out brigade” (the largest of all, naturally) that seemed to offer them some protection and structure. I used to charge for doing some basic tourist assistance and research a basic fee of one set of kids’ clothes and a couple liters of milk. Recognizing that a middle-aged foreigner going to visit a homeless kids” encampment could be easily misunderstood, I’d bribe a nun to accompany me when I’d drop off my ill-got gains with the kids at my local park. The kids were, if nothing else, polite and better mannered than you’d expect from shoplifters, narcotics retailers, and glue sniffers. I was hardly the only person doing this (and the nuns were happy to pitch in, even without a donation). Charity in Mexico is not — as in the northern countries — something you foist off with a check to someone else. It’s hands on. And… based in both the Indigenous cultures and in the Hispanic Islamic-Judaic-Christian tradition… the concept of charity as a benefit to the giver is strong. One gives a peso to a begger not because you think “give a man a fish today…” but because it earns you a blessing… or good karma. Yeah, you need to teach a man to fish, but before you do that, you have to get him a fishing line, a hook and a worm… and he’s got to have enough calories in his stomach to get to the river. And fishing line, hooks, worms … and calories… require more than feeling the need for occasional good karma. The Federal District provided some basic services like medial attention, and offered some drop in social service clinics, but there isn’t a lot of money available. The Quakers and a few others — including the Brigada Callejara (which includes the Prostitutes’ Union, feminists and homeless advocacy organizations) — offered some ad hoc assistance. At one point, mostly to shame the government into action, dissident teachers organized an open air school at the Angel of Independence. It wasn’t an ideal situation, but it beat what’s happened as a result of “social cleansing”. At least living in the parks provided the younger kids with some kind of protection and a semblance of a “home life” that’s been lost when Guiliani recommended, and the Federal District adopted, anti-vagrancy statutes that made sleeping in the parks overnight a criminal offense. Photo courtesy of Flickr user D LeRoy under a Creative Commons license. The World Bank announced that China’s economy would grow less than expected this year — bad news for the rest of world, including the United States. The World Bank said China’s gross domestic product would grow by only 6.5 percent, down from its previous forecast of 7.5 percent made just last November. China, now the world’s third-largest economy, behind the US and Japan, has been experiencing phenomenal growth, with its economy expanding at a rate of 10 percent or more every year since 2002. Over the last several years, China has helped fuel growth around the world by spreading its money around. Now, there are worries about the fallout from the downturn. For more, watch the Worldfocus interview: China’s troubled economy ripples across the globe. David Dollar is based in Beijing and is the World Bank’s country director for China and Mongolia. He writes at the “East Asia & Pacific on the Rise” blog to break down China’s complex economy. We launched our China Quarterly report today with our take on how to reconcile the conflicting data. Clearly, the global economy is in very poor shape. Global GDP declined at an annualized rate of 5% in the fourth quarter of 2008, and global industrial production declined at a 20% rate. These are shocking numbers that those of us born after the 1930s have never seen. Naturally this has had a large effect on China, which is an open, export-oriented economy. China’s seasonally adjusted monthly exports peaked at around $120 billion last fall, and then fell off a cliff – dropping by about one-third (see chart). The other obvious area of weakness is the real estate sector. Even before the global crisis began to affect China, the problems of excessive price rises and over-building were apparent. In the first two months of 2009, real estate investment showed zero growth over the year before. So, two important sectors of the economy – real estate construction and exports have either zero or negative growth. But it is not all bad news. The government’s 4 trillion Yuan stimulus package is for real and is already having visible effect. Infrastructure investment is rising rapidly: railway investment, for example, is up more than 200% from last year. This has backward linkage to industries such as cement (real production up 17% in January-February from the year before). Real retail sales have held up quite well (up 15% in January-February from the year before) indicating that many households are spending the large increases in income they have seen in recent years. We feel that these data tell a complex but coherent story. Export-oriented manufacturing and real estate construction are in decline, while at the same time there is rapid growth in infrastructure investment, manufacturing industries tied to that, and household consumption of both manufacturing items and services. Photo courtesy of Flickr user slumberingheart under a Creative Commons license. On Tuesday, Marc Ravalomanana resigned as Madagascar’s president after troops loyal to opposition leader Andry Rajoelina entered his office by force. The resignation comes following weeks of political turmoil and protests, which have damaged tourism and investment prospects. The armed forces assumed power and Rajoelina, who is favored by the military’s chief of staff, is expected to lead the transitional government. Michael Keating is the senior fellow and associate director at the McCormack Graduate School’s Center for Democracy and Development at the University of Massachusetts, Boston. 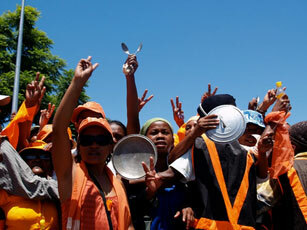 He writes at World Politics Review to provide a background of Madagascar’s political upheaval. Most Americans know about Madagascar, located in the Indian ocean off the coast of Africa, from the eponymous Disney animal movie featuring the feuding lemurs and fossas. Indeed, the fauna of the world’s 4th-largest island is spectacular. The human side of Madagascar, on the other hand, is not such a fun place these days. […]By African standards, this is a pretty tame affair. But for Madagascar, a place of recent political instability but decent economic growth, the conflict is a disaster. Looming near the bottom of the world’s poverty tables, Madagascar has recently been benefiting from major investments from mining giant Rio Tinto and energy behemoth Exxon Mobil. In addition, in a move that has sparked some of the protests, the government of Ravalomanana has leased 3 million acres of prime farmland — about half the size of Belgium — to Korean super-conglomerate Daewoo. The Rio Tinto Mineral Sands project is the largest foreign investment in the island’s history. It has, however, come under a withering attack by environmental group Friends of the Earth and London-based Panos. Exxon Mobil also came under some heat from Greenpeace last year for allegedly killing melon-headed whales with its advanced echo sounding equipment and will surely face more environmental challenges once it begins drilling in earnest. The feud between the president and the upstart mayor seems to be more about personal egos and power needs than anything else. The basis for the criticism of the president seems to surround his lavish life style and “lack of caring” for the island’s almost 20 million poor. Depending upon which way the army swings, the mayor could find himself assuming power in the coming weeks or be forced into exile. As in so many poor African countries, power is a zero-sum game about control of the country’s riches. No matter who comes out on top, it is not likely to affect the lives of Madagascar’s poor. The only real effect will be to slow down investments, and to drive away the tourists who would like to see the lemurs and fossas in person but who will now have to content themselves with the Disney version. Monks head online in Phnom Penh. Several decades ago under the communist Khmer Rouge, Cambodia was isolated and cut off from much of the outside world. While the Internet has since expanded the range of global communication, most Cambodians still lack Internet access — only about 70,000 people are online. Tharum Bun is the information technology manager at The Asia Foundation in Cambodia and writes at the “In Asia” blog that while Internet access may be scarce, those who have embraced the Web — including a former king — have used blogs to engage in dynamic and open dialogue. Cambodia has over 13 million people, but currently, less than 2 percent have regular access to the Internet. Cambodia’s official language is Khmer, but these Cambodians who chat, e-mail, and blog on the Internet – and the approximately 23 percent of Cambodians who text with their mobile phones – find it easier to use English. While low Internet penetration, language barriers, and technical issues with using the Khmer scripts limit the amount of Cambodians who can engage in online dialogue, those Cambodians who are entering the international blogosphere are breaking a pattern of devastating silence and isolation. The former King (or King Father), Norodom Sihanouk, now 86, makes regular postings about Cambodia’s past and present on his website. The former Prince – fluent in Khmer, French, and English – posts communiqués and reactions to media reports regularly. Originally launched in 2002, the King’s website became a new digital medium for global visitors. Cambodian media largely use their websites as a source for information, taking the King’s comments and those of his critics, and translating them into Khmer. The King’s online conversation and personal digital medium is inspiring young Cambodians to engage the Internet as a forum for discussion and debate, and to learn English as a second language. After the Khmer Rouge fell in the 1980s, Cambodia experienced a big baby boom; today 60 percent of the population qualifies as youth. Because of their English language skills and affinity for technology, Cambodian youth make up the largest number of Internet users in the country and are, like the King, engaging in online debate. This group of active Internet users writes mostly in English, given both the technical difficulties of inputting Khmer characters, as well as the widespread use of English among their audience: their own peers and the international online community. This dynamic online dialogue has helped pave the way for a more open discussion in a country torn by civil wars in recent decades. The trauma inflicted by the Khmer Rouge regime (1975-1979) is still a major point of discussion in Cambodia. Cambodian intellectuals, who were once the target of mass killings, and their surviving children, use their knowledge of the English language and technology to express their opinions and views. To move Cambodia past years of silence, this is essential. The King has used his website to post his thoughts on social order and past politics, encouraging today’s Cambodian youth to use online forums, chat rooms, and blogs to discuss issues from everyday life to larger, social issues. While this new emergence of online voices, in a language other than their own, doesn’t necessarily reflect the progressive thinking of the entire nation, it is a starting point of voiced, diversified opinions. 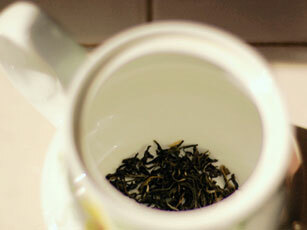 Photo courtesy of Flickr user Magalie L’Abbé under a Creative Commons license. The “Harry Potter” series by J.K. Rowling has received criticism from numerous religious groups since its inception, most pointing fingers at the books’ themes of magic and wizardry. Some Christians have shunned the series due to its portrayal of witchcraft, as have a handful of Islamic Web sites that have issued a fatwa on the books. It was high time that anti-Semitism would find something hipper than those dusty Protocols of the Elders of Zion, concocted sometime between 1895 and 1902 by Russian journalist Matvei Golovinski and then used by the pro-Tsarists to discredit reforms in Russia as a Jewish plot. Egyptian and Syrian state media have turned the Protocols into television series, trying to modernize the plot and bringing it forward into the 20th century. Iranian TV has beaten them hands down with “Harry Potter and the Ziono-Hollywoodist Conspiracy.” J.K. Rowling, that English (and no doubt, fully Aryan) rose, as avatar of the globe-encircling Jewish kraken? Yes, though the evidence is a bit disjointed as the clip unfolds on YouTube. The basic visual argument is hardly as compelling as the original Protocols which, after all, have real-life Jews who have real faces and names, working out complicated plans to conquer the world and pollute the race. You only get Harry and his buddies and professors flitting in and out of the picture while the voice-over proclaims a story line that actually has nothing to do with Messrs. Voldemort and Dumbledore. It is “Witchcraft and Brainwashing” that spreads the “evil essence of Zionism.” This is how the logic apparently works: Since Harry Potter movies are all about W ‘n’ B, they are a Zionist tool. Along with “devil worship,” W ‘n’ B will corrupt “innocent children and youth” around the world. Why is this a Zionist tool? Because witchcraft was invented by the “rabbis of ancient Egypt.” Now we get a few seconds from the Order of the Phoenix even though it does not contain witchcraft-mongering rabbis. But wait. Aren’t those longbearded faculty at Hogwarts kind of Jewish-looking? Didn’t we see Jewish symbols in every Harry Potter movie? I swear, the kids were playing with dreidels in The Philosopher’s Stone. And when they assembled for a meal in The Order of the Phoenix, they were actually celebrating Passover. You thought the matzohs were crackers, eh? Whenever the kids joust and fight, they are actually preparing for the Last Battle that will do in or enslave all the Muslims. What does this have to do with Harry Potter? Well, because in the next volume, Iranian TV intones, he finally wants to face down Voldemort. That will be the mother of all battles, to coin a phrase—a secret metaphor (and call to arms) for Armageddon. Personally, I find this insulting to the Jews. Previously, the Iranian propaganda line painted the “Little Satan” as mighty regional superpower. Now, this TV clip puts down Israel/Jewry as a bunch of losers who no longer have the will and wherewithal to subjugate the Muslims directly and by force of arms. Now, they have to rely on a bunch of kids—on Harry and Hermione—to execute their evil designs. Associated thumbnail courtesy of Flickr user alvarezperea under a Creative Commons license. A rally ahead of El Salvador’s presidential elections. The people of El Salvador will head to the polls on Sunday for the country’s presidential election, and debate has swirled over whether the country will make a left turn and elect Mauricio Funes of the Farabundo Martí National Liberation Front (FMLN). The ruling conservative Arena party has governed the country for two decades. Sebastián Chaskel is a research associate for Latin America Studies at a foreign policy think tank in New York City, and is originally from Bogotá, Colombia. He writes at “Latin American Thought” about U.S. influence on the election. It has become a cliché to say that Latin America is no longer the United States’ backyard. An Inter-American Dialogue report that came out yesterday mentions “[t]he growing assertiveness and independence of Latin America and the Caribbean,” as well as the “declining ability of the United States to exert authority and shape outcomes in the region.” A Brookings Institution report a few months ago discussed the “enhanced confidence and autonomy” of the region’s countries, and a CFR report flatly called the Monroe doctrine obsolete. Even President Obama as a candidate echoed these sentiments. “The situation has changed in the Americas, but we’ve failed to change with it. Instead of engaging the people of the region, we’ve acted as if we can still dictate terms unilaterally,” he said in Miami last May. 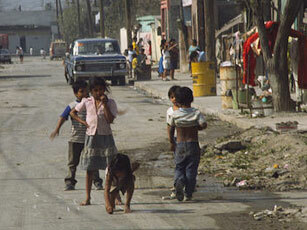 But a look at El Salvador this month would have you thinking otherwise. As the country approaches presidential elections this weekend, the United States has been front and center in both mayor candidates’ campaigns. 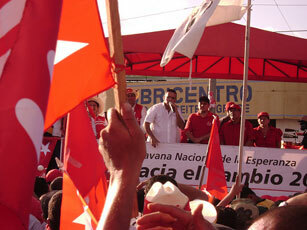 Mauricio Funes, running for the left-wing FMLN released ads in December that directly compare him to U.S. President Obama. One of them congratulates President Obama on his victory and states that Funes looks forward to working with him on immigration reform. He even uses Obama’s slogans, in Spanish and English. U.S.-El Salvador relations trump bread and butter issues in El Salvador because bread and butter depend on this bilateral relationship. The number of Salvadorans abroad (2.5 million) is comparable to El Salvador’s work force (2.8 million). Remittances, which account for about 18% of the country’s GDP, have been El Salvador’s most important foreign exchange earner for years. They drive consumption, which in turn drives economic growth, accounting for 96% of it in 2008. This helps explain why for the past four years El Salvador had been the only Latin American country to maintain troops in Iraq. In exchange for the contribution the U.S. government extended Temporary Protected Status (TPS) to El Salvador, which allows about 230,000 Salvadoran immigrants to remain legally in the United States. When President Saca agreed to keep 200 Salvadoran troops in Iraq in August 2008 he was thanked by an 18-month extension of the TPS program. But a country the size of Massachusetts, El Salvador’s dependence on the U.S. does not end with remittances. In 2001 the country adopted the U.S. dollar as legal tender and the United States is El Salvador’s number one trading partner, accounting for 50% of its exports and 35% of its imports. In a country where virtually everyone has family members in the U.S. and where rice and beans are paid with bills featuring George Washington, people understand that their prosperity depends on one special relationship, and they have reasons to suspect the U.S. cares about who they elect. Photo courtesy of Flickr user MJParadaC under a Creative Commons license. 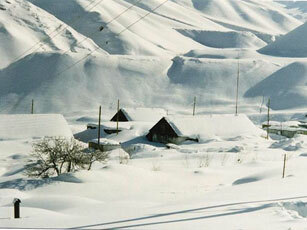 Tajik people have weathered harsh winters and shortages in electricity. For the second winter in a row, the country is facing energy infrastructure problems. Hundreds of Tajiks died in the cold or went hungry last winter, due to electricity shortages and crop devastation. This year, the U.S. has pledged $5 million in emergency aid to help needy Tajiks. Ilan Greenberg of the Pulitzer Center on Crisis Reporting ventures to the Tajik capital, Dushanbe, and writes in the “Untold Stories” blog about the country’s crippling problems. Dushanbe comes off well when compared to, say, Kabul. But the Tajik capital fares less well in comparison to most other places. Running water and electricity are pretty constant in the tree-lined city center. But basic, working infrastructure degrades the farther it is from government ministries and the presidential residence dominating Dushanbe’s low rise urban nucleus. Drive just a few minutes and street lights stop working, apartment block windows flicker by minuscule candle light, and only the piercing of flashlights break the blackness in alleyways and courtyards. The situation is even more dire outside Dushanbe’s city limits. Tajikistan’s borders are heavily patrolled by soldiers and guards (with significant assistance from American drug enforcement officials) trying to interdict the huge poppy smuggling coming out of neighboring Afghanistan in the south (or profit from it, in which case presumably without assistance from American drug enforcement officials) and with the smuggling of about everything else from Kyrgyzstan and Uzbekistan to the north and east. The countryside is wracked by devastating problems – from catastrophic water and energy shortages to rampant child labor practices in the cotton fields to jobless villages where Tajik men returning from Russia face unending unemployment. Last winter was catastrophic for farmers – a devastating cold front moved into the country and stayed for months, knocking out the winter crop. People froze and went hungry. This winter was warmer, but farmers continue to buckle under the hardships of lack of accessible water, lack of electricity, and the widespread and enforced requirement to grow unprofitable and unsustainable cotton. Photo courtesy of Flickr user Brian Harrington Spier under a Creative Commons license.